The arms are those of Wilson impaling Freke, as borne by Edward Warter Wilson and his wife, Frances Anne, daughter of George Freke 2nd Baron Carbery. They were married on September 1, 1756. This lot and the preceding scent bottles are part of a matching toilet service. 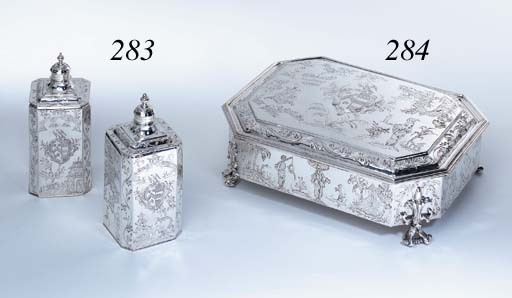 A pair of toilet boxes and a pair of toilet jars from the same service are being offered in the sale of Important Silver, Objects of Vertu and Russian Works of Art, October 23, 2000, lots 484 and 485.